Ever since Charles De Gaulle famously referred to his political vision as “a certain idea of France,” French politics has figured as a battle between competing notions of what France is. Le Pen’s message ahead of Sunday goes further. Macron, she insinuates, is not pushing a certain idea of France; he’s the anti-France, the non-France. From the first words of her speech on Sunday night, it was clear Le Pen would use the two weeks between rounds one and two to paint Macron as the embodiment of the system, but in recent days she’s begun to argue that Macron is somehow not even French. Meanwhile the pitch of her opponent — who by name, linguistic preference, intellectual habit, slim-fit navy suit and love of a Parisian brasserie meal remains, as far as we can tell, indubitably French — is more nuanced, but only slightly: Macron says he wants to be the president of “patriots” and defeat the “nationalists” of the Front National (FN). The polls, largely unchanged in the three days since the first round, continue to show Macron beating Le Pen by a margin of around 20 percentage points (60%-40%) in the runoff. Little in Predata’s digital signals today offers a credible basis to question the polls’ prediction of the overall outcome. In particular, the digital contest in the swing regions — those départements we identified earlier this month as being a key barometer of Le Pen’s second round hopes — shows the two candidates neck and neck (see above; link to signals). 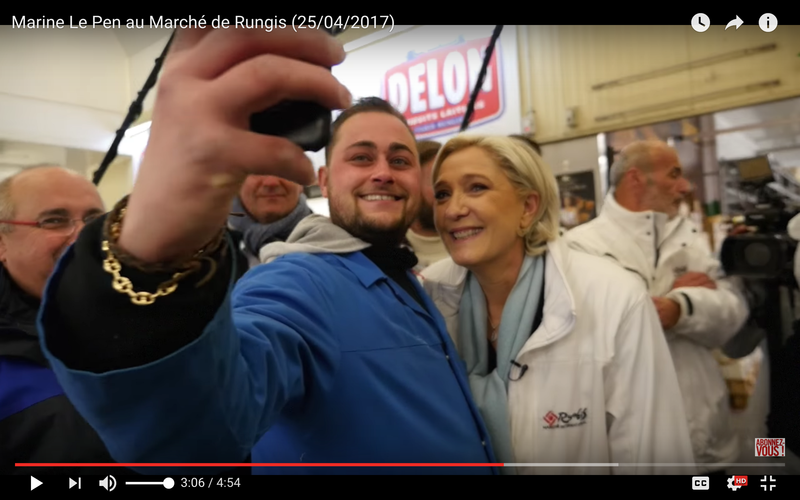 Le Pen’s digital presence in these regions, in other words, is barely more forceful than that of Macron — not a good sign for the (sometime) FN leader, who needs to win convincingly in the swing hinterlands if she’s to have any hope of breaking the tyranny of what she earlier this week called “the rotten old Republican front.” Republican discipline did for her father in the second round of the 2002 presidential election and again for her party in the second round of 2015’s regional elections; given the swiftness with which leaders across the political spectrum — including the defeated first round candidates François Fillon and Benoît Hamon — have rallied behind Macron, there’s good reason to think it will keep the FN out of power again this time round. But to point out the obvious, the race is not yet run. Bearing in mind the factors we identified on Sunday as the key determinants to the second round outcome, the contest may end up being much closer than the polls suggest. Here are six reasons why. 1. The overall digital contest is fairly even. Le Pen dominates the digital campaign when only Wikipedia and Twitter sources are included in the signals (see first chart below) — this being the method we’ve used to analyze the digital campaign to date and the method that accurately reflected the outcomes in previous electoral contests such as Brexit, the Italian constitutional referendum and the U.S. election. However, once YouTube sources are added to the signals, the relationship is flipped and Macron dominates (see second chart below). What does it mean for Macron to be stronger on YouTube, while Le Pen is dominant on Wikipedia and Twitter? It means, essentially, that Macron’s campaign is generating more short-term enthusiasm and buzz around each successive wave of messaging, since YouTube videos rarely garner much interest beyond the third day after their publication, while Le Pen has a larger core of true believers online. Bottom line: Macron is winning the contest to generate short-term buzz in the digital domain, but Le Pen has a more committed base. Macron’s supremacy on YouTube is fairly ephemeral (not to mention recent), whereas Le Pen’s dominance on Wikipedia and Twitter is relatively stable. As things stand today, Le Pen has a slightly stronger position in the online campaign; that advantage is not sufficiently large to disturb the base case of a Macron victory in the runoff, but it does suggest that Le Pen’s support may be higher than polls suggest. 2. The endorsements game has not yet played out. The main pieces of the Republican front to keep Le Pen out of power fell into place pretty quickly in the 24 hours after the first round results came out: Fillon, Hamon, former PM Manuel Valls and President François Hollande, along with countless other political leaders, unions and civil society groups, all called on voters to support Macron. But Republican discipline is now a second round strategy with a living track record and known historical consequences. This potentially lessens the martial, end-of-days authority of the appeal to block Le Pen: voters who obeyed Republican discipline in 2002 and endured the disappointments of Jacques Chirac’s second term might be tempted to try something more adventurous this time round. Even among the political families endorsing Macron, there has been notable dissent. On the right, Christine Boutin, a former housing minister in the Sarkozy government who leads the small Christian Democratic party, has said she will vote for Le Pen in the second round. La Manif pour tous, an anti-gay marriage lobby group, has called for voters to reject Macron in the runoff. Nicolas Dupont-Aignan, meanwhile, the right-nationalist candidate who got 5% of the vote in the first round, has yet to make a public endorsement for the second round. Online, the conversation appears to tilt even more strongly in favor of a Le Pen vote. Many of Mélenchon’s supporters plainly see a greater evil in the pro-market economic liberalism of Macron than the xenophobia and anti-immigrant posturing of Le Pen: “The neoliberalism of Macron is responsible for millions of deaths worldwide,” announces one Mélenchon supporter in the conversation chain on Twitter extracted below. And many have also made the point, over the last 48 hours, that Le Pen’s economic policies are far closer in spirit to those of Mélenchon than those of Macron are. The more actively conversations such as these take root online, the thinner Macron’s margin of success in the second round is likely to become. 3. Abstention could hurt Macron more than Le Pen. Linked to both endorsements and the commitment of each candidate’s base, abstention is the biggest risk weighing on the second round outcome. Currently polls put the participation rate for the runoff around 73% — low by the standards of recent second rounds, which have generally seen turnout levels around 80% — but it could end up being even lower, given the depth of anti-establishment sentiment expressed in the first round and the collapse of the Republican and Socialist parties, historical guardians of Republican discipline. The more voters stay away from the ballot box on May 7, the greater the risk of a surprise victory for Le Pen, whose base has always been more committed than the young and untested coalition underpinning Macron. Already a campaign has begun on social media, under the hashtag #SansMoiLe7Mai (“May 7 without me”), to call for mass abstention in the second round. Should Mélenchon, following the conclusion of his supporter survey, call for abstention among his supporters (a not-negligible possibility), that could further tilt the balance back in Le Pen’s favor ahead of the second round. 4. Predata’s “online” spread between France’s presidential candidates of the extremes and center suggests the OAT-Bund spread should widen over the coming 12 days. [Link to signals] The spread between our digital signal for the presidential candidates of the extremes (Le Pen, Mélenchon, Hamon) and the signal for the candidates of the center (Macron, Fillon) has closely tracked and at times led swings in the French-German 10-year government bond yield spread throughout the presidential campaign (below). Ahead of the first round we predicted, based on the narrowing in the Predata “online spread,” that the OAT-Bund spread would tighten this week; that is indeed what happened, as the market cheered the first round result and Macron’s confirmation as the runoff favorite. In recent days, however, the Predata spread has widened. If the digital signals continue to lead the bond market, the OAT-Bund spread should rise again over the coming days — which, in practice, means that Le Pen will start to make the race more competitive. The final debate between Macron and Le Pen on Wednesday May 3 looms as a key event to watch in this regard: Macron has been poor in the debates to date, and it’s easy to see him becoming flustered under sustained, bullying fire from Le Pen when they face off next week. Le Pen, not surprisingly, has squeezed every ounce of electoral advantage out of Macron’s clumsy Sunday dining choice. She’s also moved to decontaminate her campaign of its association with the troubled history of the FN, stepping aside from leadership of the party — a symbolic gesture, but a clever one nevertheless — and pledging to be a president “for all French people.” In practice what this means is that she’s started quoting De Gaulle a lot — the standard proof in France of a right-leaning politician’s Republican credentials, and an important way for her to position her candidacy within the mainstream of the Fifth Republic’s history. Is it all too little, too late? Possibly, but there’s no doubt that so far, she’s winning the battle to stay on message.